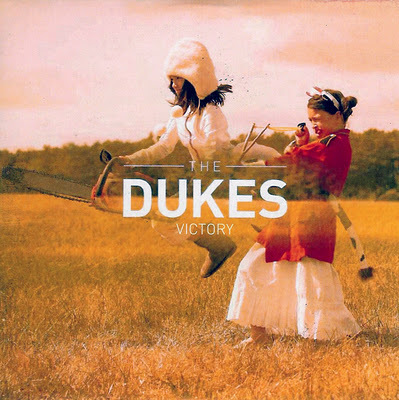 in 2010 singer/guitarist Shanka and drummer Greg Jack formed The Dukes, after they had been playing together a lot in a band named "No One Is Innocent". They did a small European tour and recorded their debut album Victory. They already played the Melkweg in support of The Subways in October. According to themselves they were inspired by bands like The Dandy Warhols, The White Stripes and Nirvana. And the album holds thirteen of those raw garage rock tracks. And indeed those influences can be clearly heard. Some of the songs like 'Resilient Lovers' strongly remind you of especially The Dandy Warhols. The band is lacking their own sound here. The song named after themselves on the other hand is a rough song with screaming guitars. Slower songs are following it and there's quite some variation. In title track 'Victory', where Garbage clearly can be heard, the monotonous vocals in the choruses aren't helping the song. The vocals aren't always that great throughout the album anyway. The production is pretty smooth now and then, maybe even a bit too much. The music loses too much of its edge and energy in that case. Since especially in the energetic songs, where the band is going full force, that's where The Dukes are at their best. The strong 'The Mangler' is a song that does work. The musicians sound more in their comfort zone there and that's where their strength is. They should stay clear from wanting to sound too much like their inspirations. This was evident in their half an hour in the Melkweg. The boys have enough quality and experience to put down something of their own. Victory is showing too many faces. The album is flying into every direction. Sometimes it's strong, but it has just as many weak moments. When the band are able to focus on their strong points and continue into that direction, it could lead to something nice. It's not a bad album, but they are definitely not leaving a lasting impression. Listen to 'Victory' on Spotify.